Saru Silver offers Brazing Alloys for Tungsten Carbide Tipped Tools in various compositions suitable for different applications. These general purpose alloys are appreciated for excellent mechanical properties and bear good wetting characteristics. These are preferably used for brazing hard metals to steel mountings. Addition of nickel and manganese improves wettability on tungsten and molybdenum materials. Is a general purpose alloy with excellent mechanical properties. The nickel improves wetting on carbides and produces a less free flowing alloy. This gives a thicker braze joint, better able to accommodate higher stresses. 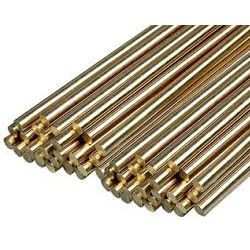 For brazing tungsten carbides and substances which are difficult to wet. Is economical alloys with good wetting characteristics. Used extensively for carbide tip brazing, but its application is restricted by its relatively high melting points. For tungsten carbide and stainless steels. Is economical alloys with good wetting characteristics, used preferably for brazing hard metals to steel mountings. Addition of Nickel and Manganese improves wettability on tungsten and molybdenum materials.. Its application is restricted by its relatively high melting points.